Zhou Peiyuan (Chinese: 周培源; Wade–Giles: Chou P'ei-yüan; August 28, 1902 – November 24, 1993) was a Chinese theoretical physicist and politician. He served as president of Peking University, and was an academician of the Chinese Academy of Sciences (CAS). 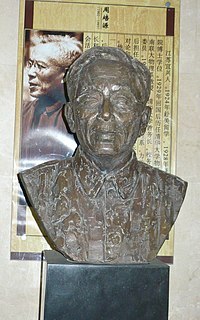 Born in Yixing, Jiangsu, China, Zhou graduated from Tsinghua University in 1924. Then he went to the United States and obtained a bachelor's degree from University of Chicago in Spring of 1926, and a master's degree at the end of the same year. In 1928, he obtained his doctorate degree from California Institute of Technology under Eric Temple Bell with thesis The Gravitational Field of a Body with Rotational Symmetry in Einstein's Theory of Gravitation. In 1936, he studied general relativity under Albert Einstein in the Institute for Advanced Study at Princeton. He did his post-doc researches in quantum mechanics at University of Leipzig in Germany and Swiss Federal Institute of Technology Zurich. He was a professor of physics at Peking University, and later served as the president of the University. He was elected as a founding member of CAS in 1955. ^ a b "Zhou Peiyuan Is Dead – Educator-Scientist, 91". NY Times. 25 November 1993. This page was last edited on 5 April 2019, at 04:41 (UTC).